Old pottery lends a charming and rustic appeal to any outdoor setting, and can even turn into the focal point of an inviting patio. 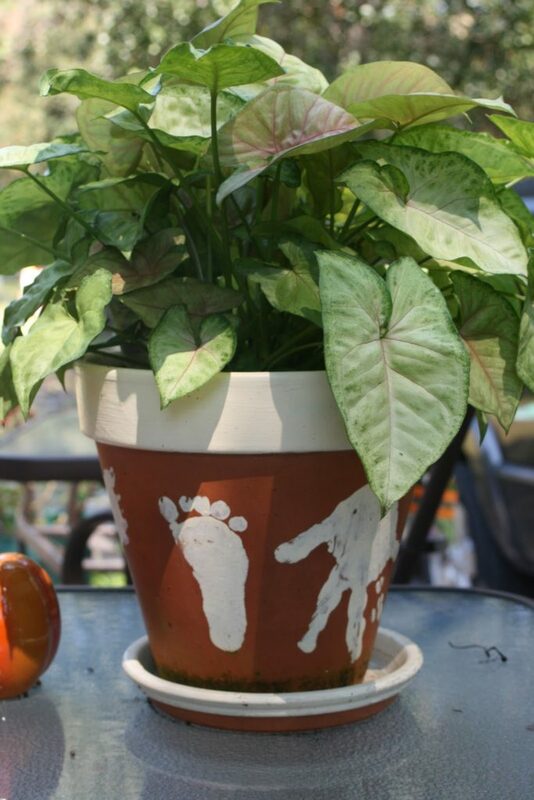 Flower pots of all shapes and sizes can be found at yard sales and thrift stores for a bargain. It doesn’t even matter if the pot is cracked, discolored, or unattractive at first glance. 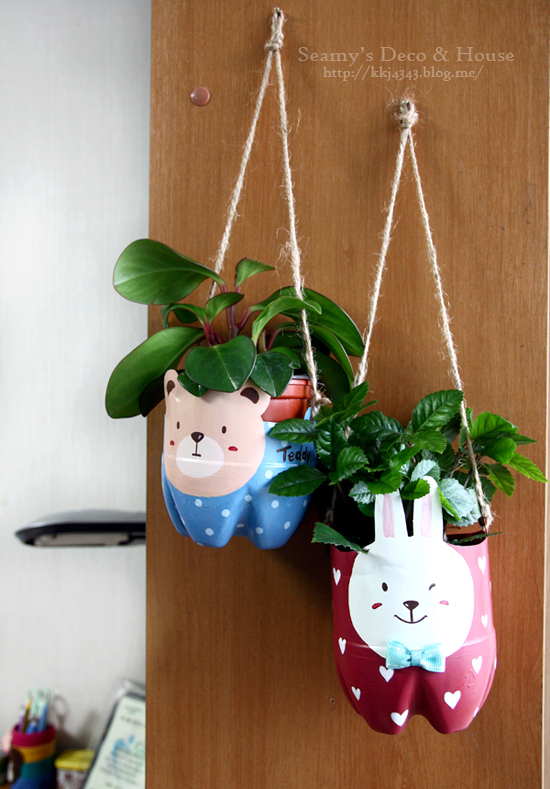 With a few different shades of bright paint (meant for withstanding the outdoors), you can give new life to any number of old pots. Have fun experimenting with primary colors, patterns, and crackle paint. 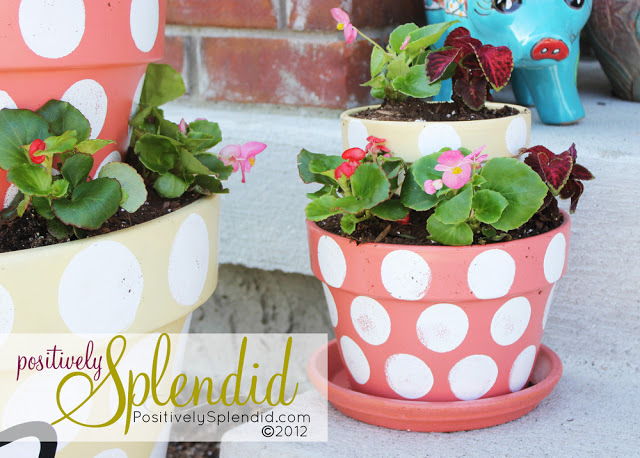 A quick internet search can give you dozens of ideas for pretty pots for your spring flowers. 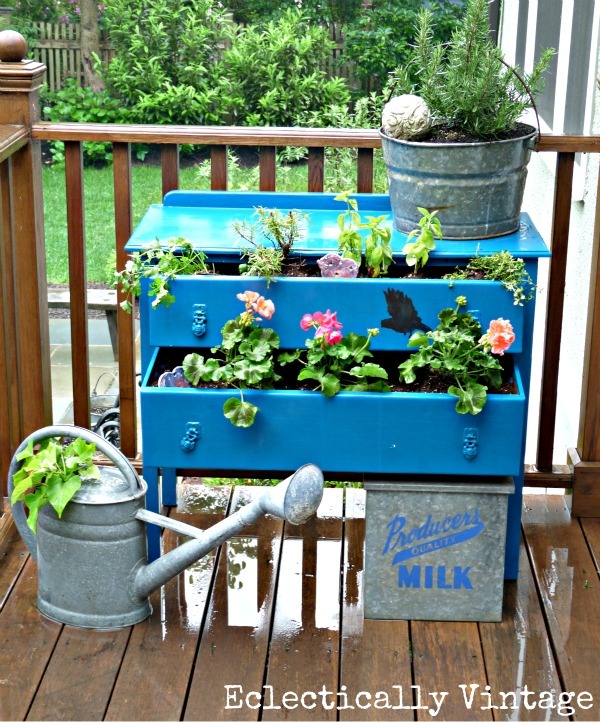 One of the best ideas we’ve seen lately is a rustic gardening cabinet made from an old dresser. Any dresser with a vanity mirror will do, or also a hutch. Paint the dresser in a dark color, then add a second light coat, such as white or cream, and sand the edges and corners for that charming shabby look. 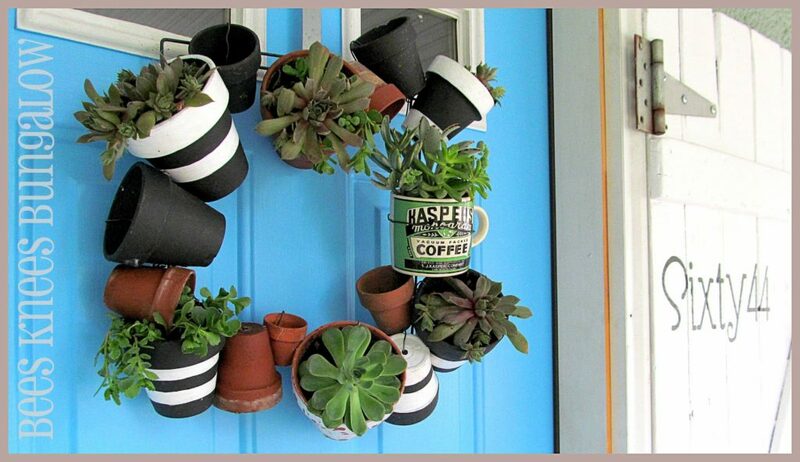 Replace the mirror with a peg board for hanging your gardening tools. 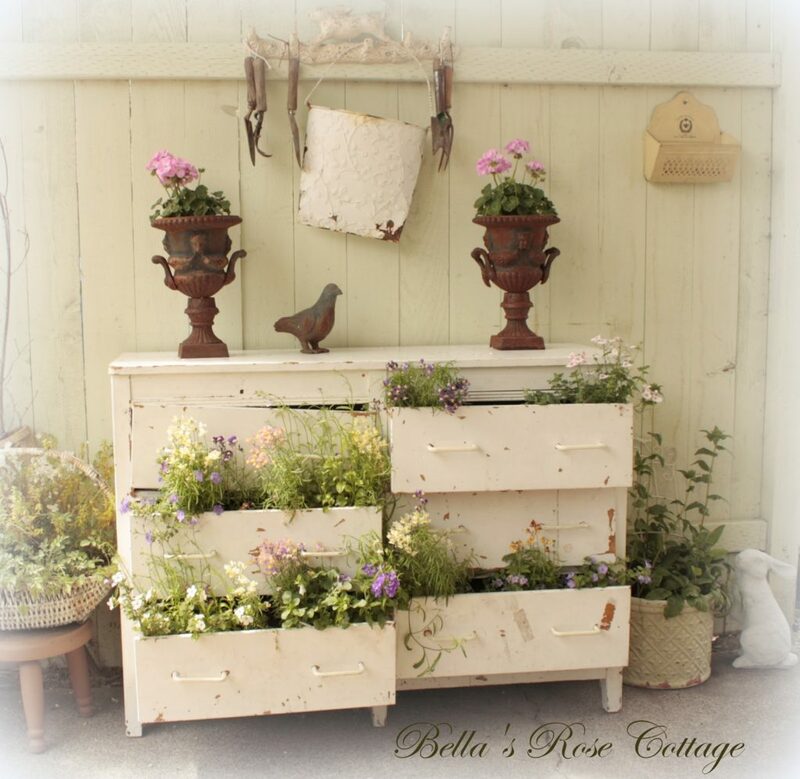 The drawers are perfect for additional materials, while you can save the surface for projects, seedlings, and pots. 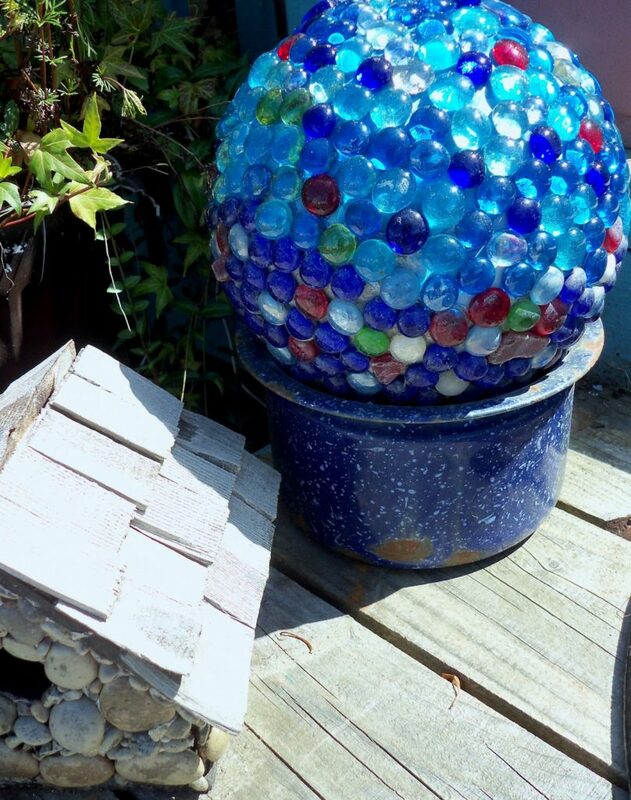 Are you wondering what to do with that old bowling ball in your closet that you haven’t rolled down an aisle in forever? 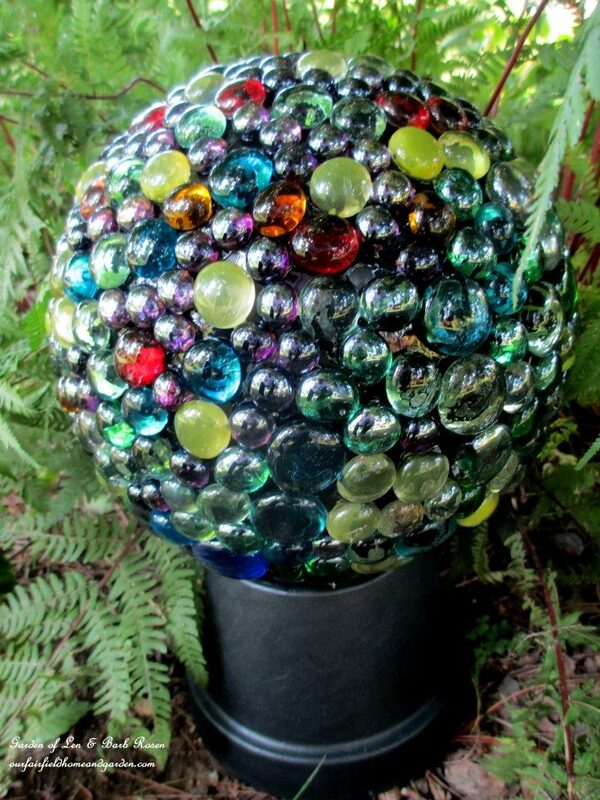 All you need to turn that bowling ball into a beautiful and unique garden accessory are some sandpaper, heavy-duty adhesive, painter’s tape, and reflective embellishments like glass beads, multi-colored mirror fragments, or metal washers. 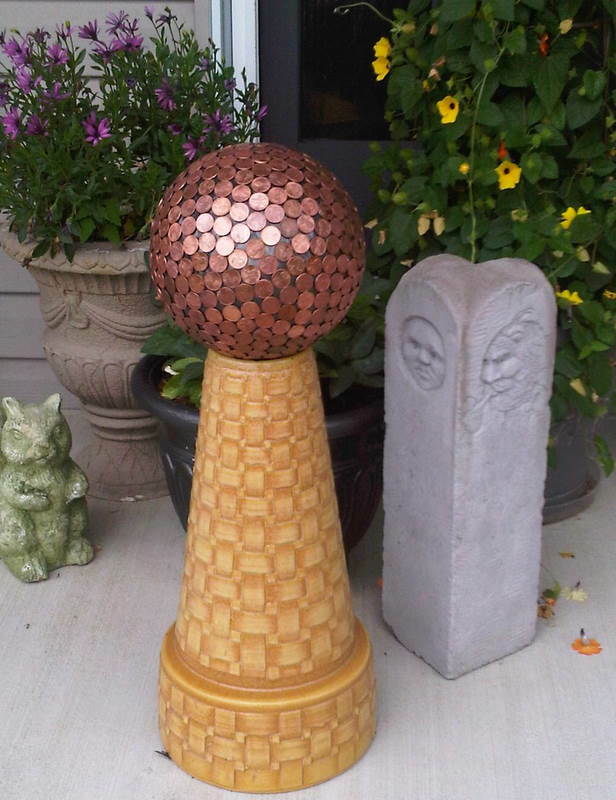 After sanding down the smooth surfaces of the bowling ball and embellishments (for better adhesion), carefully glue on the embellishments one at a time and secure with the tape until the glue has cured. 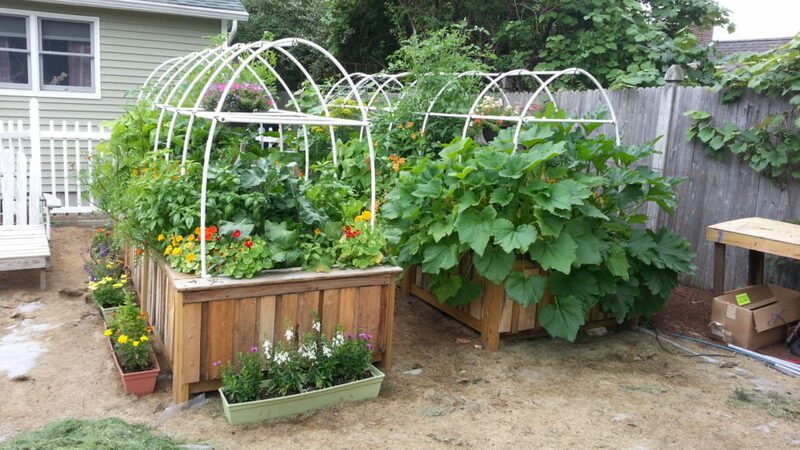 Whether you’re a seasoned gardener or are ready to start a new garden this year, now is a good time to get your garden beds ready. Raised gardens not only look nice, but are easier to work in and help keep your plants separated and weeds under control. 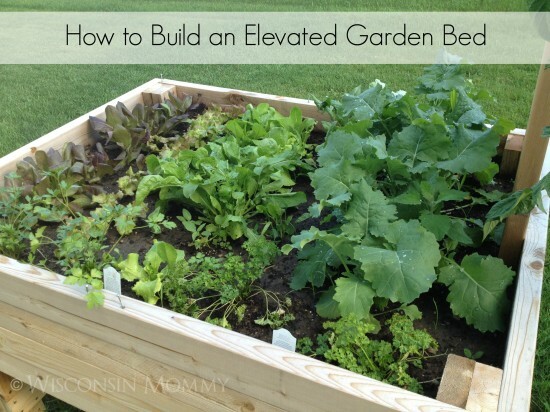 Building a raised garden can be as easy as stacking bricks or cinder-blocks to the desired size and height – be sure to mark the circumference of the bed with string before building, and use a plant-safe mortar to cement the bricks together. Some gardeners use cinder-blocks as mini-gardens, planting small bunches of herbs inside the blocks’ holes. We’ve even seen people recycle old tires by laying them on the ground and filling them with garden soil. 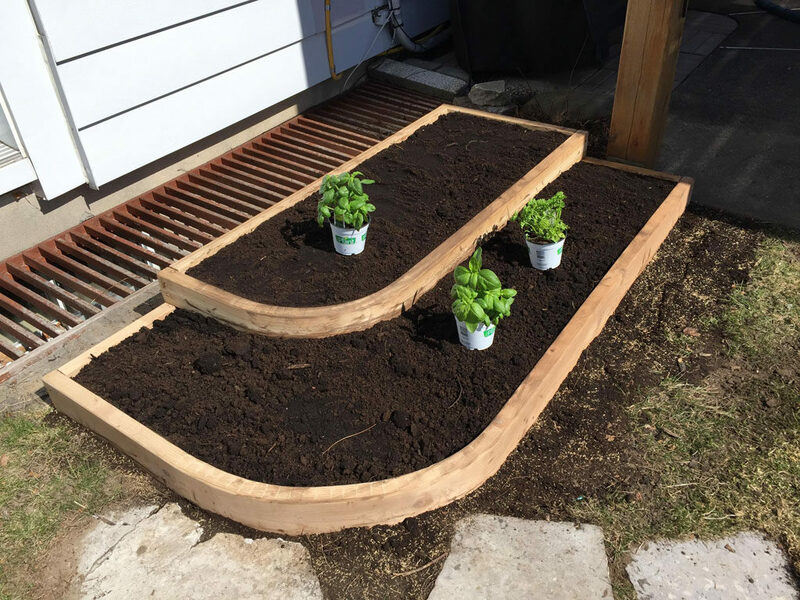 If you’re handy with wood, you may want to build raised beds out of lumber that look professional and uniform, and are long-lasting. 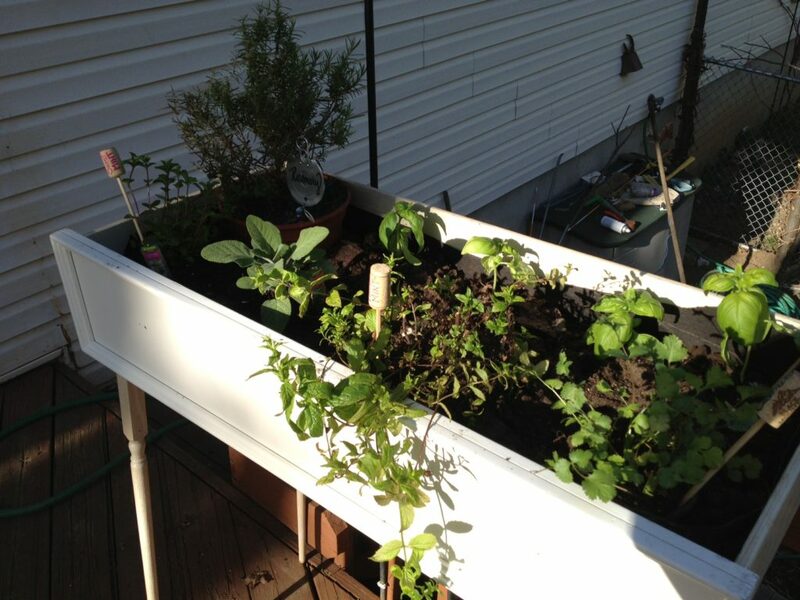 A multitude of tutorials are online describing how to build raised planters. 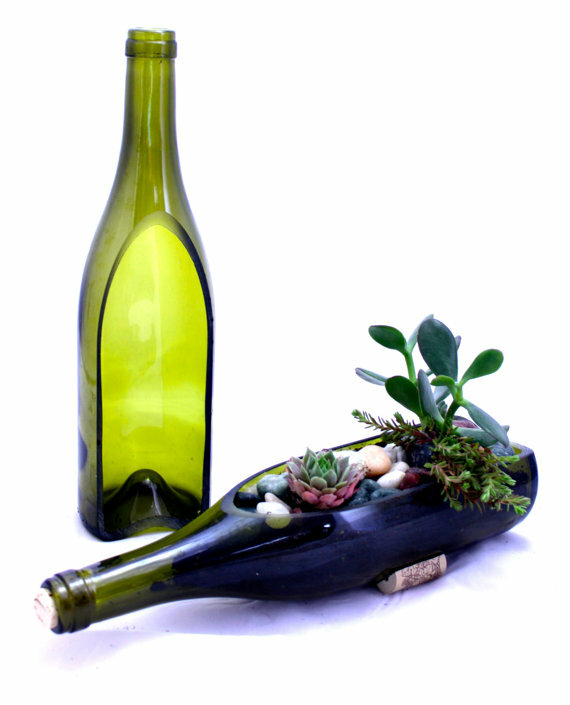 Another of our favorite ideas for outdoor or indoor charm is the bottle planter. 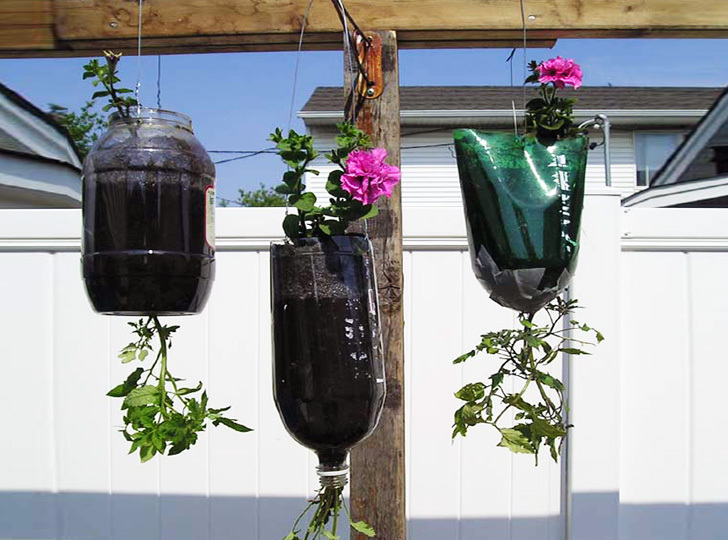 For a simple solution, all you need is twine or wire, a collection of glass or plastic bottles or jam jars, and your imagination. After tying the twine around the bottle necks, hang them from hooks or from a frame, then fill with dried flowers or colored water (corks come in handy for the latter). Some people like to drop in battery-powered tea lights for a lovely effect when having guests over at night – which look especially charming when the bottles or jars are made of different-colored glass. 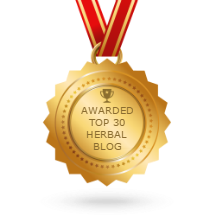 For more complex ideas, many crafters and DIY bloggers have wonderful imaginations! 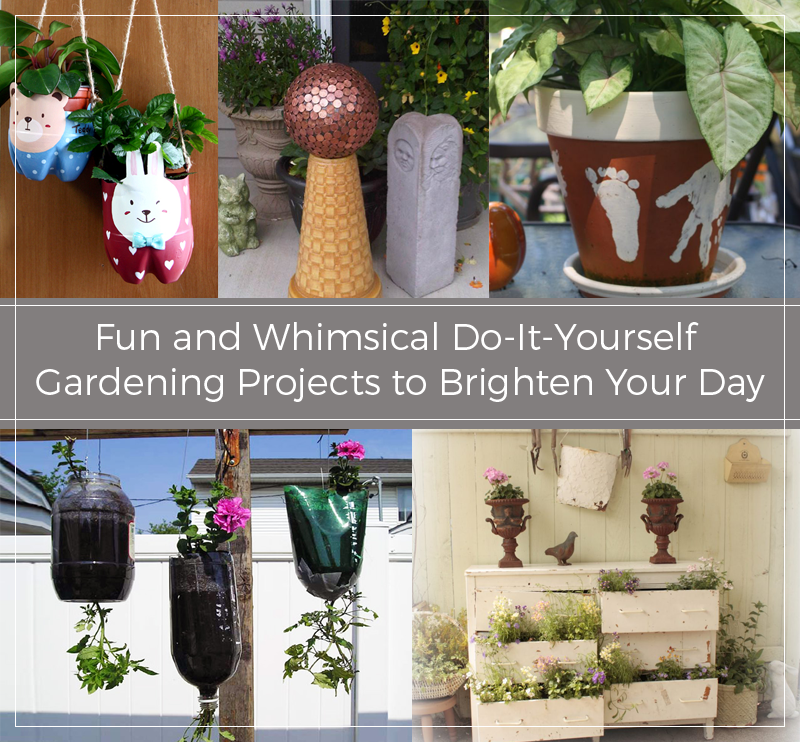 These are just a few of the many different ideas that are sure to get you inspired and excited for your backyard this spring. 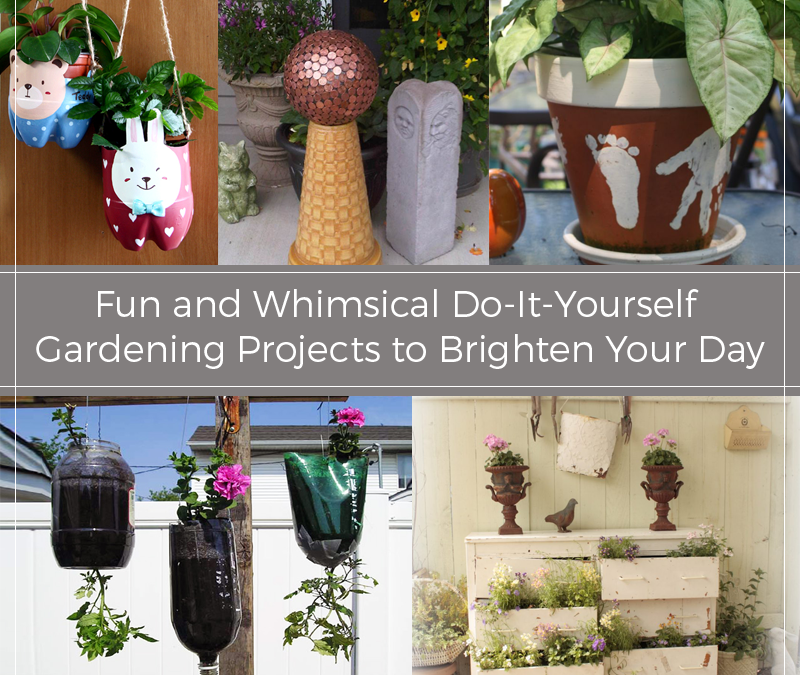 Most popular outdoor projects these days are low-cost as well as fun and easy to create, which makes it possible for anyone to get in touch with their imaginative side this season! 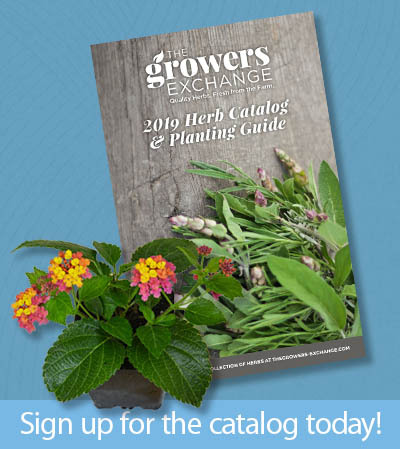 And as always, you can peruse our selection of farm-fresh herbs.